On Sunday, Hillary Clinton finally announced she'll be running for president in 2016. Without question, Clinton is the Democratic front-runner. No other Democrat has announced, and those who are likely to run aren't nearly as notable; she is the clear favorite among Democrats and particularly among Millennials. According to a widely cited Fusion poll, 55 percent of Generation-Y wants Clinton to be our next president. This isn't all that surprising, as a majority of Millennials who participated in the midterm elections voted Democratic (55 percent). 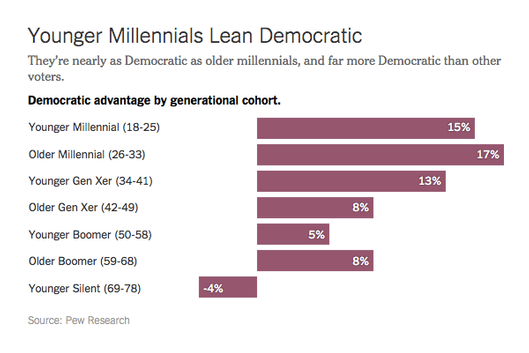 Other polls have also shown Gen-Y overwhelmingly favors Democrats. This doesn't mean all Millennials align themselves with the Democrats, however, but it's quite clear we tend to prefer this party due to its stances on a wide number of issues. But it seems that Clinton diverges from Millennials on an issue we are repeatedly associated with: marijuana legalization. Clinton is not necessarily opposed to pot legalization but, as Vox notes, her stance is very similar to that of President Obama and many other politicians. It's evident she doesn't see legalization as a pressing issue, and she would rather leave it up to each individual state. She's also argued she doesn't believe research surrounding the benefits of medicinal marijuana is conclusive. But at present, polls show a majority of Americans, especially Democrats, support the legalization of marijuana. Even within this majority, Millennials stick out in terms of their pro-pot stance. As the chart above reveals, Millennials are the only generation in America in which both a majority of Republicans AND Democrats support weed legalization. Shane Smith, the founder of Vice, recently interviewed President Obama, covering everything from climate change to weed legalization. When the conversation turned toward pot, Smith noted that marijuana legalization seems inevitable and asked the president why he's held back on it. Smith argued that if President Obama legalized weed, it would conceivably be the biggest part of his legacy for young people. It shouldn't be young people's biggest priority. Let's put it in perspective. Young people, I understand this is important to you. But you should be thinking about climate change, the economy, jobs, war and peace. Maybe way at the bottom you should be thinking about marijuana. The president then went on to concede that keeping marijuana illegal has certainly had negative consequences, particularly in relation to the War on Drugs. Millennials would definitely agree; our support for marijuana legalization is not driven by a simple desire to get stoned and eat Doritos without legal ramifications. Rather, this generation is also legitimately concerned about the detrimental impact the failed War on Drugs has had and continues to have on American society. It's resulted in discriminatory policies, mass incarceration and billions of wasted dollars every single year. So it comes as no surprise that the movement for pot legalization has escalated as Millennials have come of age. Four states and Washington DC have now legalized recreational marijuana (although sales are still banned in DC). Given this trend, you might wonder why Hillary continues to hold back on the issue. A majority of the country, her constituents and Millennials support legalization, and they're motivated toward this position by both social and financial factors. Garnering support from Millenials is huge for any candidate. After all, we're the largest and most diverse generation in US history; our support could mean the difference between winning and losing an election. It's true that Gen-Y currently appears to favor Hillary, and it's doubtful we would vote against her simply because of her stance on pot. She's also obviously not currently in a position to take action on this issue, given she's not in office. Still, she has much to gain and little to lose by coming forth and stating, "I believe marijuana legalization, or at least decriminalization, is a sensible approach to an issue that a majority of Americans have taken a clear position on. If nothing else, I'm open to discussions on this issue and not entirely opposed to the notion of legalization." Generation-Y is notoriously apathetic about voting, which was especially apparent in the recent midterm elections. Fortunately, we're typically more enthusiastic about presidential elections, and if a candidate promised to legalize weed, turnout for young voters could reach historic levels. Not to mention, a majority of voters in three key swing states -- Ohio, Florida and Pennsylvania -- are pro-legalization. While it might sound farfetched, marijuana could be the issue that makes or breaks candidates in the 2016 presidential election. America has spoken on weed, and while it may not be the most pressing issue at hand, it's time for the government to listen.